Their sophomore album is out July 7. 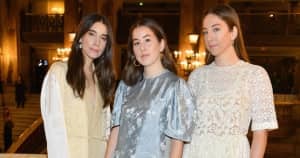 Gearing up for the release of their second studio album, Something To Tell You, LA-based sister-trio Haim have shared the project's third single. "Little of Your Love" is an upbeat jam that's sure to draw more of the friendly Fleetwood Mac comparisons that have swirled around the band since 2013's Days Are Gone. It's propelled by thumping drums and funky electric guitar riffs and features a taste of the sisters's signature catchy harmonies on the yodel-esque chorus from which the song gets its name. Though they performed the track alongside the previously released "Want You Back" on Saturday Night Live last month, the studio version just landed this afternoon. Listen to "Little of Your Love" below and look out for Something to Tell You next month.